Pertemps Network were crowned the 2016 P1 SuperStock champions after a commanding victory at the Grand Finale in Bournemouth at the weekend. The Welsh brother-sister duo of Sam and Daisy Coleman wrapped up the title with two victories and a third as the final round of the season took place on the south coast in blustery and wet conditions. Saturday’s racing had to be abandoned early due to poor visibility and heavy rain but it made little difference to the Pertemps team who came out and won both races on Sunday, beating rookie team Spirit of Inverclyde who recorded their best ever performance. The Inverclyde team put behind them a disappointing weekend in Cardiff where they couldn’t get out on the water to sit second on the podium ahead of championship runners-up Quantum Racing. Experience Kissimmee, who were still in with a shout at winning the championship going into the weekend’s racing, suffered a torrid Sunday as they were forced to retire from the first race of the day. 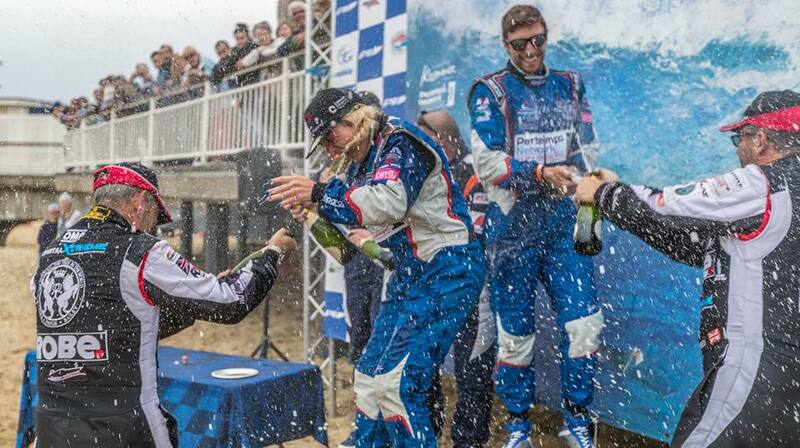 That subsequently put them out of the final race of the season and handed Quantum second in the championship. The battle for fourth in the championship was won by Rawbank Racing who overcame issues in the final race of the season to make their way round and pick up 10 points. This was enough to clinch fourth spot by seven points from E Marine Racing who were forced to retire from the only race on Saturday. South Street continued their promise from Cardiff to record their best ever result with fourth place from the overall weekend, whilst Arthur J Gallagher grabbed fifth. Highlights of the weekend’s racing will be shown on Sky Sports TV in the UK, Motors TV across Europe and internationally on the Nautical Channel later this month.